After leaving Tanah Lot without seeing the sunset, our driver drove us back to our respective hotels. My friend and I took a quick shower before heading to the airport to pick up our friend who would be arriving later that night. As soon as we picked him up, we went for dinner at Ryoshi, a Japanese restaurant located at Jalan Seminyak. I liked the ambience in the restaurant. We were seated on a wooden platform like this. The photos did not turn out good but anyway, I ate this. It was good! My friend who just arrived from the airport also ate the same dish. My other friend ate this. He told me the chawanmushi (right side of the photo) was yummy! 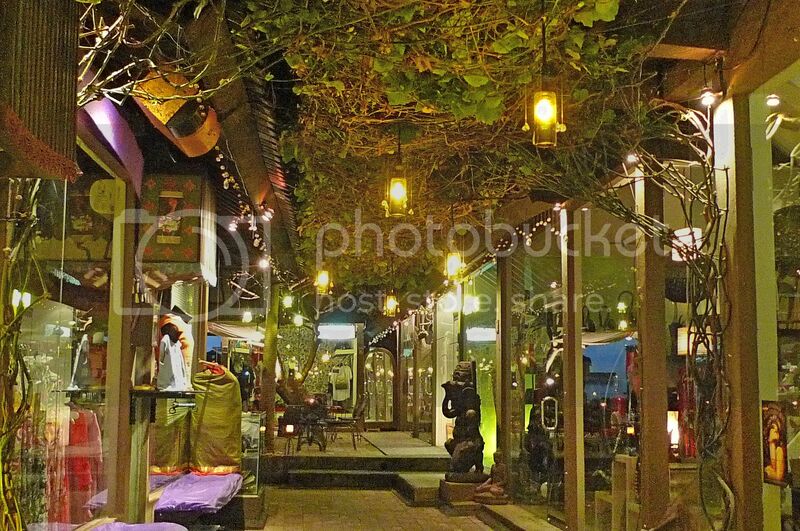 After dinner, we had a leisure walk along Jalan Seminyak before calling it a night. The next morning, we woke up early to go to the Kumbasari Market with the ladies at Denpasar. After a night of rest, both my female friends had completely recovered from their headaches the evening before. The Kumbasari Market located near the river, is a three-level (if I remember correctly) building which houses lots of shops selling household wares, clothing, groceries and souvenirs. 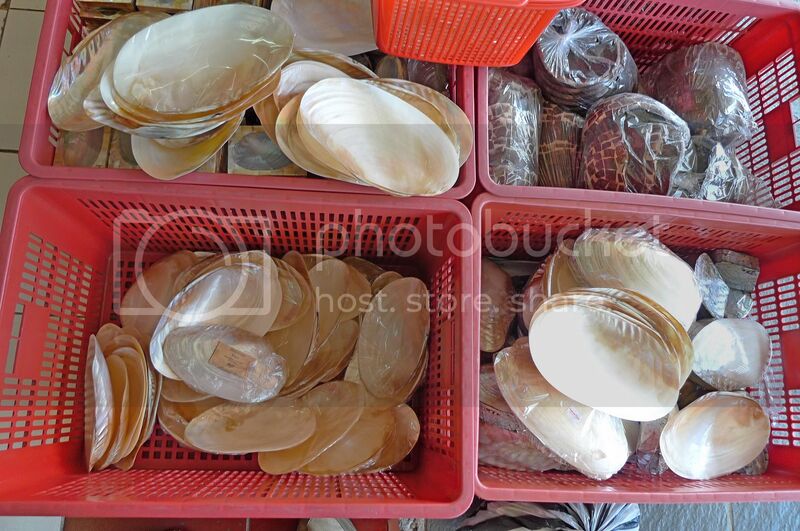 The shops selling similar items were grouped together which made it easy for us to compare prices. It was here that I bought the Maldives plates and also some Bali soaps souvenirs. 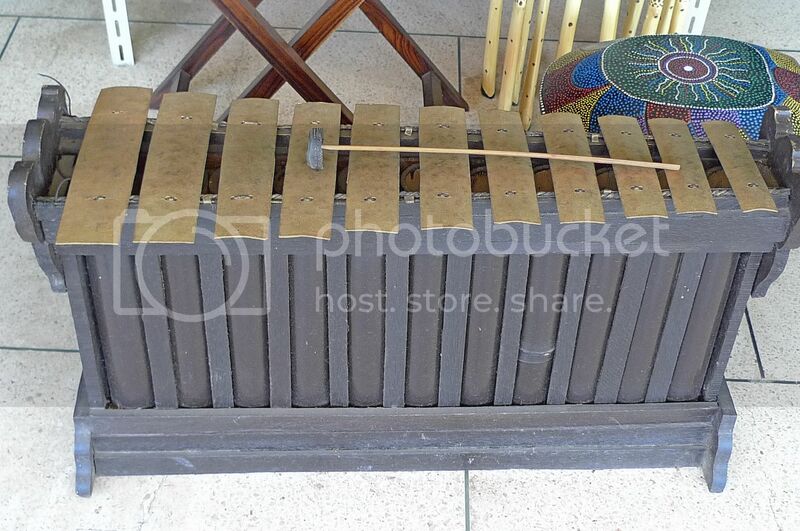 I almost wanted to buy this Balinese musical instrument that looks like the western xylophone. I tried playing on it and the sound instantly reminded me of the beautiful relaxing music I often hear during massage and spa sessions. 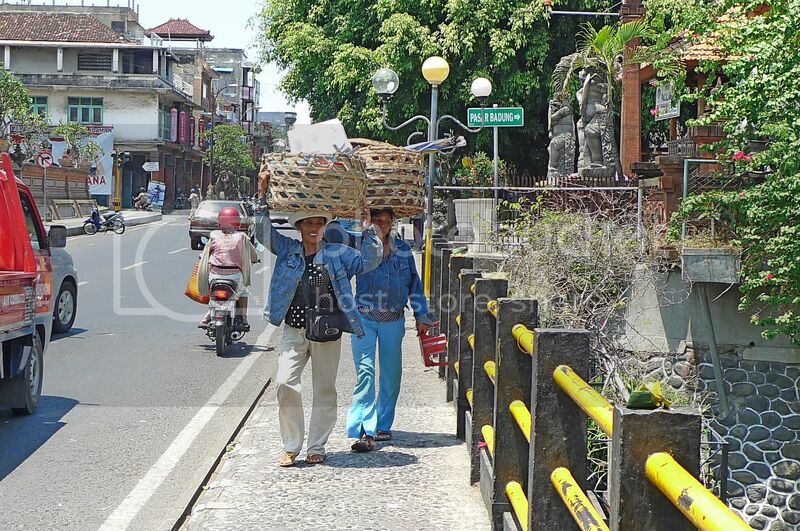 As we walked back to the car where our driver was waiting for us, I could not help noticing these Balinese ladies walking along the street carrying huge baskets on their heads. 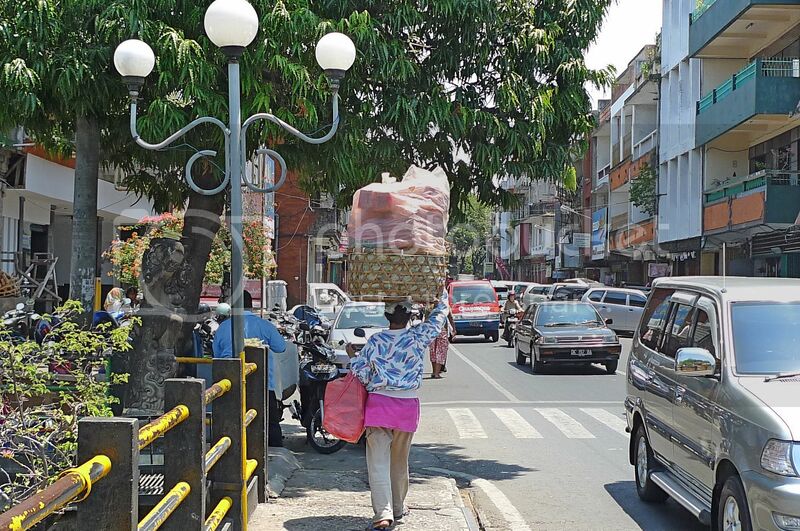 It was quite a common sight to see ladies with baskets or other stuffs on their heads in Denpasar. One thing I noticed in Bali is the lack of petrol stations. I was wondering where do car drivers get their petrol from. Then I saw this by the road side. You can actually buy petrol in bottles and containers by the road side! If they did not write the word "Petrol Asli" there, I would have thought those were some form of alcoholic drinks! Haha! Our plan for the day was to visit Ubud, the much talked about place in Bali. We planned to have our lunch at the infamous Ibu Oka to eat Bali's most popular food - babi guling or roasted suckling pig. On the way, we stopped by Batubulan to look at the many sand stone statues and stone carvings. Batubulan is renowned for its stone carvings. You could see all kinds of stone sculptures lining along the road on both side. And all these were sold at cheap wholesale prices and I would dare say 5 to 10 times cheaper than those sold in Malaysia. Do you like these cute frogs? I wonder why the Balinese like frogs so much! Hear no evil, see no evil and speak no evil! That would definitely be a topic of conversation if placed in your garden! Traditional to modern sculptures of all sizes were available. It seemed the craftsmen can make practically anything you request and even arrange to ship them to your address back home. 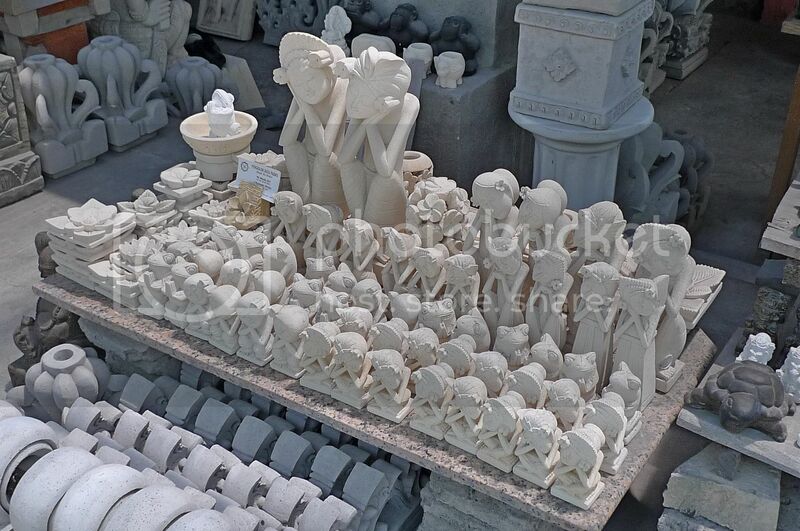 I should have asked the craftsman to make me a panda stone sculpture! Haha! After spending almost one hour at Batubulan, it was time for us to head to Ibu Oka in Ubud for our babi guling lunch, which I shall blog about next! i heard that the petrol they selling by the roadside is actually stolen one. petrol in a bottle? Wow! These people sure are enterprising! It's amazing those ladies can balance big baskets on top of their heads. 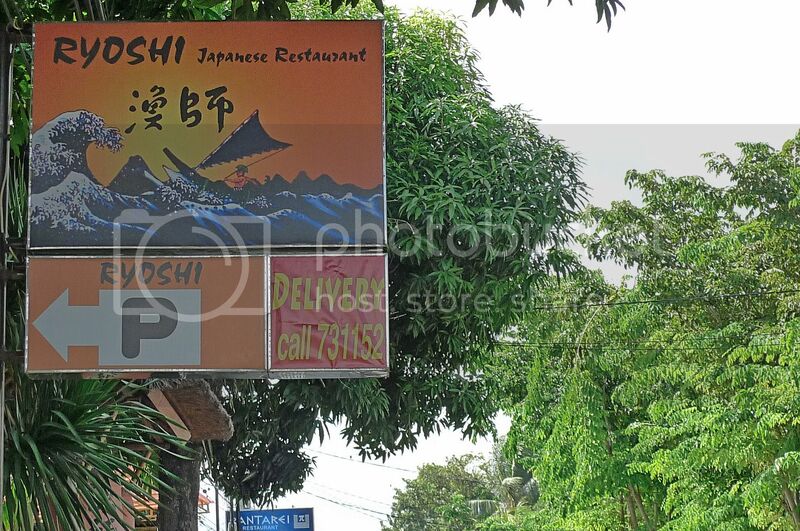 How come you guys had Japanese food in Bali? Did you try the much talked about Babi Guling dish? wah you even tried japanese food at Bali?!! that's very nice. Opps , petrol asli.....I thought it was beer! And so looking forward for your babi guling lunch.. not panda guling ah? I don't think the lousy photos will make you hungry haha! If I buy that musical instrument, tell me how to carry back? LOL! I am very kind hearted but not kind hearted enough to help those ladies carry the baskets! Haha! Frog not cute? Cute what! LOL! saucer,really? Then how can they sell it and parade those bottles of petrol in broad daylight by the busy road side? bananaz, no idea! The frogs were dancing? Are you sure? Haha! caroline ng, you are sure you not stalking my blog? LOL! Yes, next time I go, I may just get myself a panda stone statue! Haha! mei teng, cos this Japanese restaurant is famous in Bali. Most Western tourists go there! So of course I would not want to miss dining in a famous restaurant! Haha! tekkaus, yes I liked the ambience too! Nice place to dine and chit chat! The chawanmushi is not gross OK, and there's no worm! Not sure whether the petrol in the bottles are legal or illegal but they were selling it by the road side in broad daylight and it's a pretty busy street! pete, haha so did I! The bottles even had the words "vodka" on them! LOL! No, I don't want statue of panda making love! Just one cute panda is enough for me! LOL! Definitely no panda guling cos I will boycott if they have that on the menu!! LOL! the tempura set looks nice :) i'd choose the same one i guess. Wow, the chawan so big ah?! 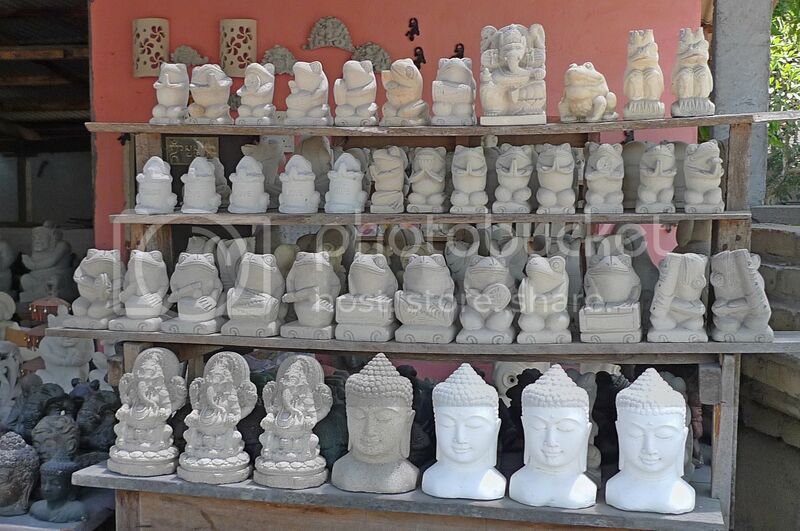 Stones carvings are very expensive in my city. 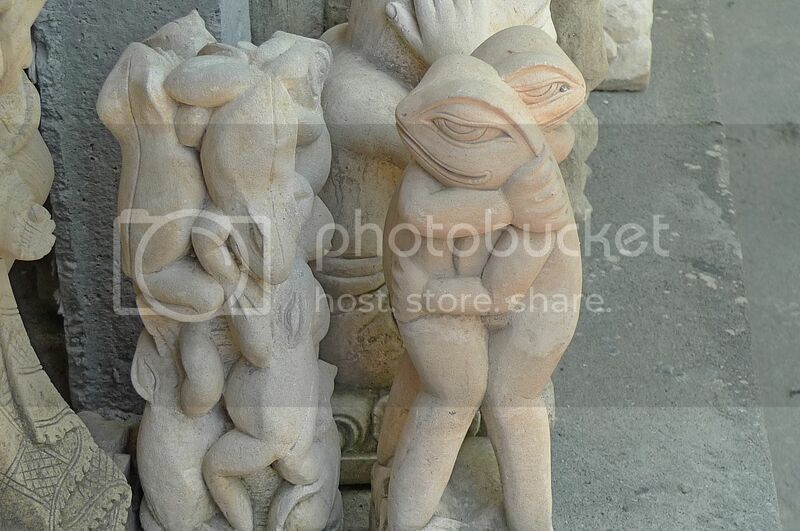 I saw a frog carving selling for $30USD at my local store the other day. If I ever visited a foreign country, I'd definitely buy these statues, worth the investment and they make very nice home decor. You know what: when I was in Bali, I purposely avoided places with lots of Westerners, for fear of terrorist attack! 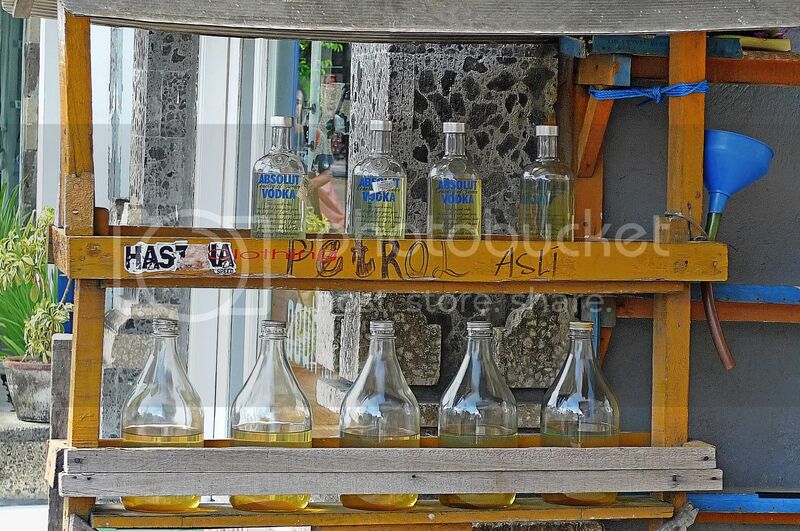 I just noticed that the petrol was sold in Absolut Vodka bottles! 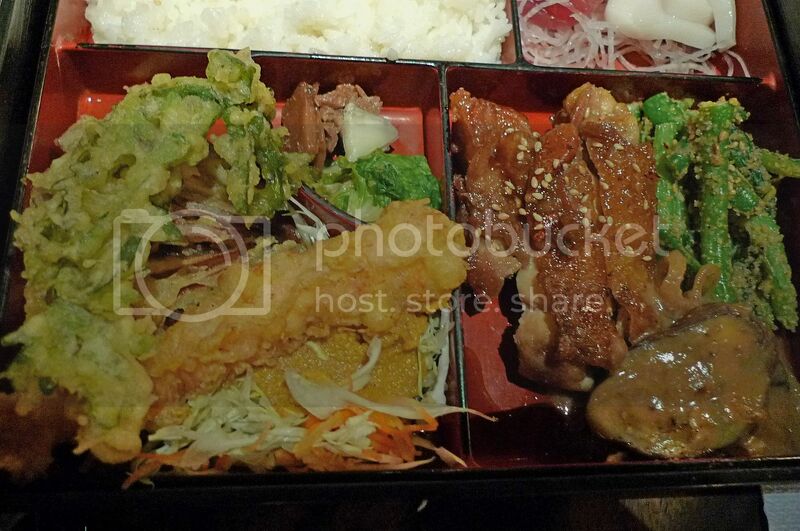 what is that green "tempura like" in the photo? is that a veggie? so her's where you bought the souvenirs ... that's nice..
the basket looks like a baby's cradle,,,,.. whaaa the figurines are so cute... and yep still frogs.. haha they really love frogs..
those statues r so cute! u really make me eager to go to bali now....i need to tahan for 3 weeks more only...the japanese food looks good ler! 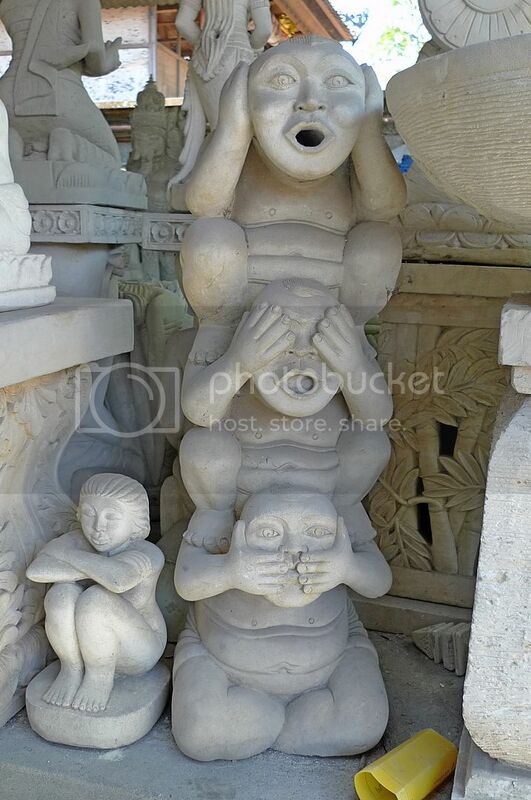 Haha I like the hear no evil statue! So cute lar! And the Japanese food looks yummy! how much was the set? Sorry not related to this post but but still blogging which Blog IDOL. Whoa must "kow tow" & salute the sifu for the being Champion 2009. Always see that champion badge of yours but wonder what it meant but now I know haha. Meant to submit the first round then to 'consult' the sifu for some tips but looks like missed the jump coz did not fully read the T&C carefully thought we submit every new set of songs every week. Gotta stand by on my submission which is not the very best choice anyway let the force be with Bananaz. tQ. 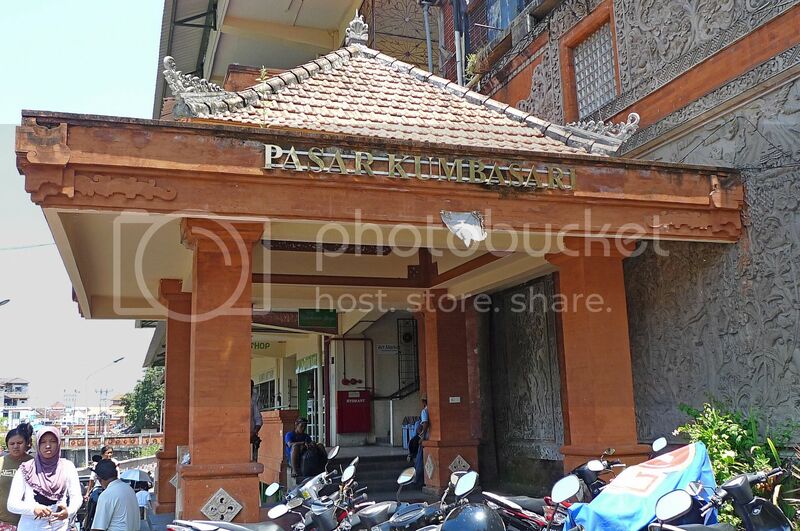 where is this kumbasari market?? why i have not heard about it when i was there?? very famous one ah?? hmmm, let me guess, sure most of your souvenirs were brought from this market?? i like that hear no evil, see no evil, speak no evil.. so cute!! but why are they not frogs since you said Balinese like frogs so much.. hahaha!! yeah, i also think the black buddha statue is very nice!! did you get one for yourself?? wah the food makes me hungry! 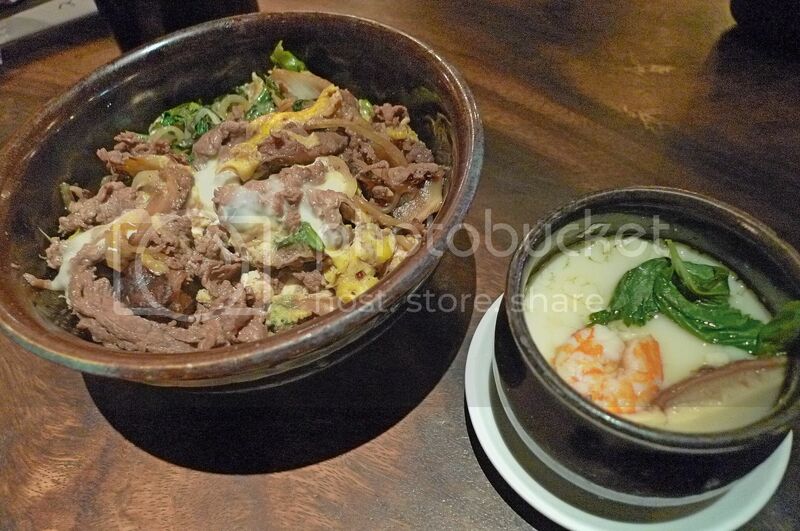 ohh I've heard that this babi guling dish is a must..
i want to eat sukiyaki and some teriyaki too! Interesting about the gas in bottles - very handy for instant molotov cocktails. Oops! Couldn't help it. The idea just came up. Looks like foreigners are their only customers. Imagine how deserted the place must have been after that terrorist attack. Thanks for sharing the pictures, Foong. Eye-opening, all of them. Thanks for all the details and all the lovely pictures.They helped to increase my knowledge of the page to a great extent.The statues were awesome.Look forward to more such interesting posts. [HappySurfer] Yo! have thought about it too much earlier. Yeah its like Jerkyll & Hyde. When at peace its Petrol Asli but when provoked the vodka immediately transform into a monstrous molotov cocktails. tQ. So nice...I want to go also!! Thanks for the virtual tour! first time i saw people sell petrol in bottle. hehehe funny. dont know why they like frogs but i know that malaysian politics a lot frogs. Hey, that’s great to be there. The sculpted works bear a unique touch and the musical instrument is awesome. The food looks to be delicious. It was a wonderful experience for you to be there. Bye and thanks for the post. Hi all panting is looking very great all is looking rarely very beautiful. 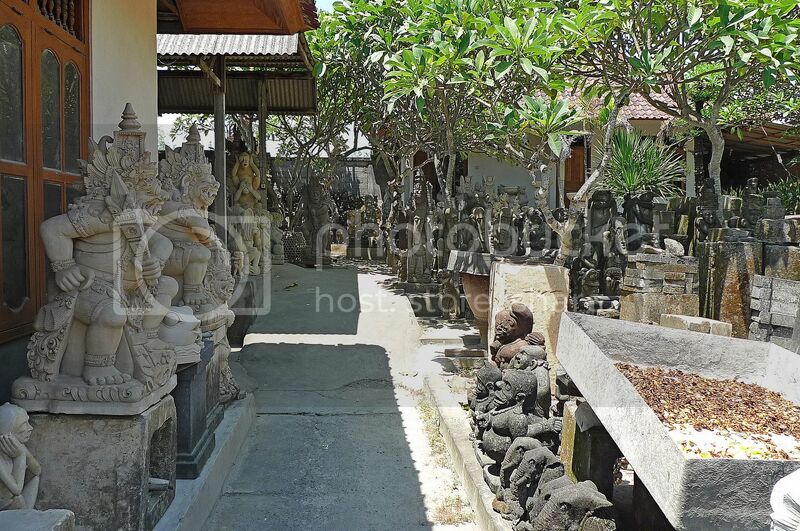 rosebelle, stone carvings can be bought in Bali at the fraction of the price you find at your city - definitely worth buying! The bottles contains olive oil? Haha! I thought they contain alcohol! khengsiong, it may be a good idea to avoid places with lots of Westerners but I think it is safest to go to Bali right after the bombings! lina, so you noticed that too! Haha! bluedreamer27, you wish to be a Japanese? Haha! Then you must visit Japan! And try Japanese food - they are really good! Yes the green thing are vegetables. And Jalan Seminyak is indeed a nice place to shop, but dating? Not too sure about that! Haha! iamthewitch, the statue is cute right? Can't really remember the price of the Japanese set, I think it's almost RM30. 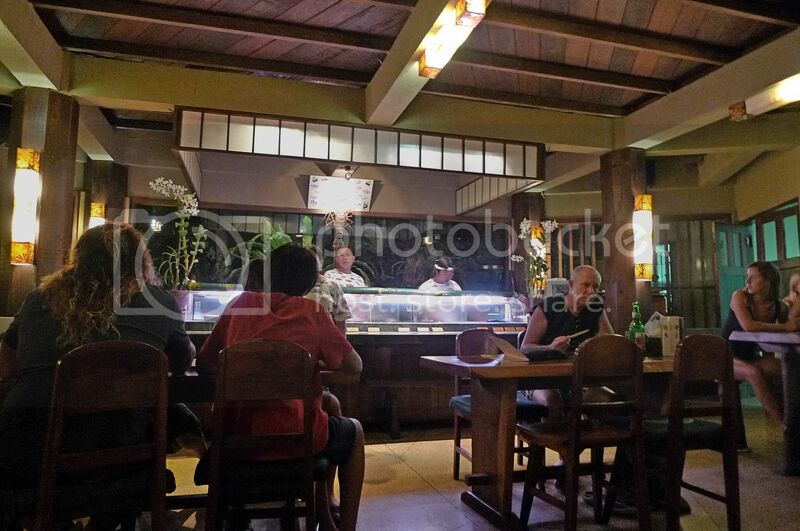 SK, you should try this Japanese Restaurant in Bali - it's really good! The Kumbasari Market is in Denpasar. Yes, it's quite a famous place to shop. I guess not every statues in Bali are frogs - it would be boring if that's the case. Haha! 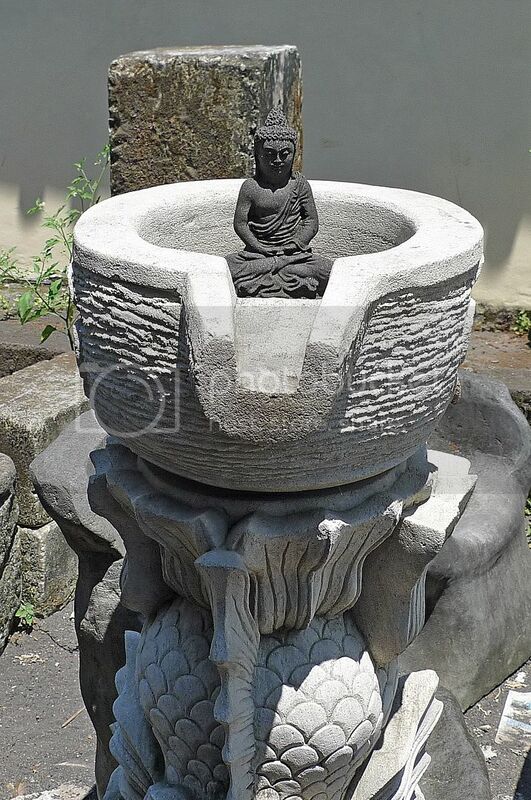 I did not buy the black Buddha Statue but my friend did. mariuca, you likie souvenir shopping? Then you'll love Bali! happysurfer, handy for instant molotov cocktail? Hmm, probably! This restaurant is very famous among foreigners, I guess business would definitely be affected after the terrorist attack. bananaz, ooh! Now you are putting ideas into people's minds - not good! cashmere, you don't like Japanese food? Why?